I first heard of Mikuni Japanese Restaurant during their official opening in September last year. But I had something on and couldn’t make it for the launch party. Time passed quickly and somehow I didn’t get a chance to drop by for a meal. 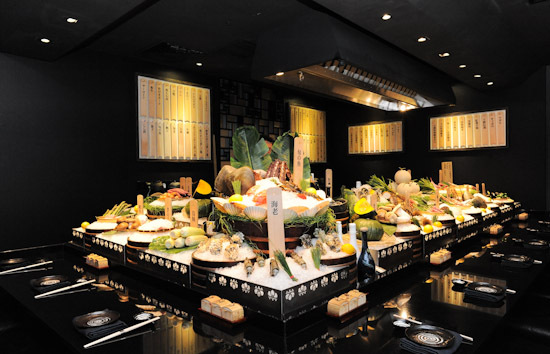 Fast forward a few months, I received another invitation from Fairmont Hotel Singapore to visit Mikuni for their Winter Robata, a culinary special featuring Hokkaido’s finest produce and flavours. 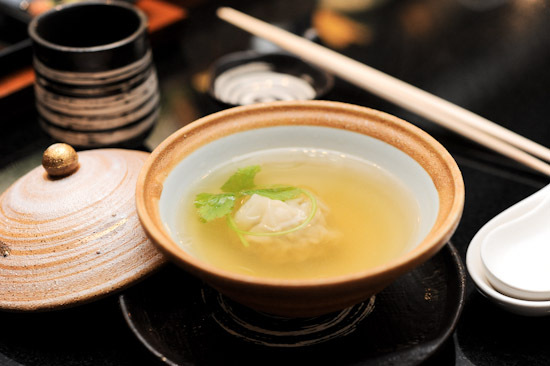 The restaurant has specially procured the freshest ingredients from the sub-prefectures of Sapporo, Tokachi, Rishiri and Hakodate, to create a 11-Course Kaiseki menu. We started our 11 course dinner ($280/pax) at Mikuni with a dry scallop paired with the classic Sapporo beer. Second course was Salmon roe with Hokkaido Smoked Camembert Cheese which was presented in a tiny bottle. One of the highlights was the Potato Pork Gyoza with Mushroom Broth. I was telling my dining companions that this was a bowl of “atas” wonton soup. Jokes aside, it was sublime. I finished everything. The Salmon was well prepared, but for me, the mushrooms were even better. My favourite course of the meal was next. The Hokotate was a clam which came in a special sauce made of sake and onion butter. It was so damn good. Unbelievable. While the Wagyu Beef with Hokkaido Wine Sauce was well received by the others, I felt that it was good, but not amazing. The visually stunning Abalone and Uni, Seaweed and Shio Gama Yaki. If you are still not full by now, there’s the Sapporo Miso Seafood Ramen to fill your stomach. Desserts too, were splendid. I thoroughly enjoyed the Milk Pudding and Apple Cake. What a lovely ending. Suffice it to say, we had a very good meal at Mikuni Japanese Restaurant. The Winter Robata promotion runs from 1 to 29 February 2012 with set menus priced at $280+++ per person and $350++ per person with sake pairing. Is it worth the price tag, though? the food presentation looks amazing and your photography skills managed to highlight the speciality of each dish! yummy!!!! It is such a beautiful restaurant, isn’t it? Food is fab too! Bro have u tried tatsuya @ good wood park hotel? So far I think their sashimi and sushi are the best of all gap restaurant here..